The Phoenix 270HTX LGR Dehumidifier is another Phoenix dehumidifier engineered for effective performance across an extreme range of temperature conditions. With a higher water extraction rate than the 200HT this unit can operate in temperatures as high as 125°F and as low as 33°F providing the ultimate in effectiveness and efficiency. The unit retains the small foot-print and commendably light weight of other units in the Phoenix range to ensure its rapid and trouble free transport between locations and minimising non-productive hours. 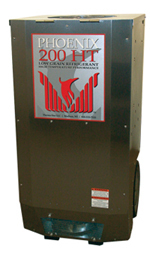 The Phoenix 270HTX LGR Dehumidifier is a high capacity unit with a water extraction rate of 161 pints per day. This rate was tested at the conditions specified by AHAM (Association of Home Appliance Manufacturers) of 80°F and 60% relative humidity. In more extreme conditions the unit will remove up to 34 gallons per day (@ saturation) and it is extreme conditions for which this remarkable dehumidifier was designed. Most refrigerant dehumidifiers are most comfortable at temperatures between 50°F and 80°F but this unit is capable of operating effectively across a range three times as great. Heavy duty dehumidifiers have a capacity for low temperature operation and those designed for water damage restoration will typically be effective until the temperature reaches freezing point. The Phoenix 270HTX LGR Dehumidifier is no exception and its effective auto-defrost system will keep this unit effective right down to 33°F. Most restoration dehumidifiers will also operate effectively at higher temperatures, from 95°F to 105°F. The 270HTX, however, exceeds the norm and continues to extract water up to 125°F. This is made possible by a system developed by Phoenix which bypasses ambient air over the condenser when ambient temperatures are above 80°F. In this higher temperature range the system directs more air over the condenser and less air over the evaporator. In higher temperatures refrigerant pressure in the condenser rises and this process reduces that pressure. The reduced flow of air across the evaporator now allows the air to cool to its dew point. In the 270HTX this procedure is controlled automatically. The incorporation of this process allows the unit to operate at higher temperatures than competing dehumidifiers which has several benefits. Higher temperatures result in higher evaporation rates which results in shorter drying times. This increases customer satisfaction and reduces time on site. It also removes the need to remove or modify equipment for temperature control. The net results are happy customers and reduced costs for the operator. These benefits are in addition to those which arise from the use of Low Grain Refrigerant (LGR) technology. By pre-cooling the air that passes over the condenser, without using additional energy, an LGR dehumidifier increases the rate of water extraction. This makes the unit more energy efficient (the Phoenix 270HTX LGR Dehumidifier draws only 8.9 amps) and allows the specific humidity to be reduced to a level unachievable by a conventional refrigerant dehumidifier, beneficial when deep drying is required. The 270HTX also provides multiple ducting options with a 12 inch intake and 10” exhaust and incorporates a motorized impeller allowing air processing at 380 CFM for faster drying and higher static pressure for ducting. The air outlet directs the dry air downwards towards the wet surface, further accelerating the drying process. The air is filtered by a MERV-11 pleated media air filter for protection of the dehumidifier and to provide better air quality in the drying area. The Phoenix 270HTX LGR Dehumidifier is completely equipped for continuous drainage and has a built-in condensate pump, providing up to 20 feet of vertical lift, and a 30 foot drain hose is supplied. All of this power comes in a compact package. The 270HTX measures 20 x 23 x 40 inches and weighs 130lb. Recessed wheels are fitted and a sturdy handle makes the unit easy to manoeuvre on site by a single person. Loading to and from vehicles is made safer and easier by the provision of an improved skid-plate on the rear of the unit. The 270HTX is engineered for durability and is backed by a five year warranty (refrigeration parts; one year parts and labor).